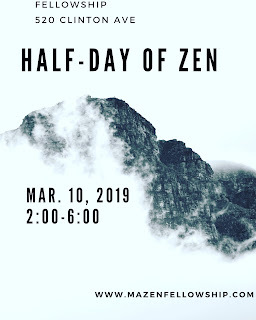 On account of Holy Week at St. Luke and St. Matthew's (our landlord), Zazen will be on hold from April 18 to April 25. We look forward to seeing you next week! "In the Shodoka, Yoka says, 'There is nothing to find in the world of satori, no person, not even Buddha. The innumerable cosmoses themselves are like bubbles in the ocean. All of the wisest and most venerable people are like streaks of lightning in the sky." 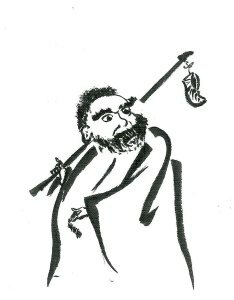 The Brilliance of komyozo zanmai [the samadhi storehouse of great wisdom--zazen] is mushotoku, unremitting effort. Unremitting effort does not mean choosing of abandoning oneself to samadhi only. Do not prefer ku, the void, or the pretext that shiki, things, should be rejected. This is a religious problem, not a social problem. When you have understood this, your mind will reflect gentleness and compassion. A sense of conviction comes, but without any act of will, and you harmonize with all existences, creating more and more infinite beauty. This is the true komyozo, shining out in our resolution. It has nothing to do with what you show other people. It is secret. True religion is like that. Joinus this Sunday for our half day zazenkai. Doors open at 1:30pm. $15 suggested donation. Happy New Year! Though we have not been updating on the website, we've been busy. From sewing rakusus to trips to New Orleans to bodhisattva ordinations, 2018 was a time of deepening practice. We hope the same for 2019. Just a reminder, we are still on winter break. 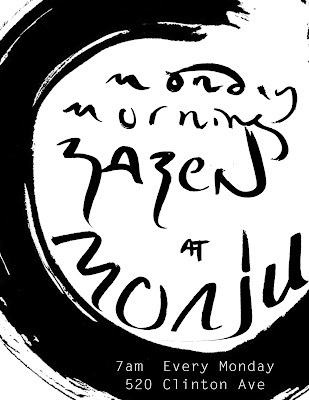 The dojo opens back up Sunday, January 6, 2019. Hope to see you there! Monju will be closed Sunday, Sept 2 and will open back up on Thursday, Sept 13. Stay in touch, though! 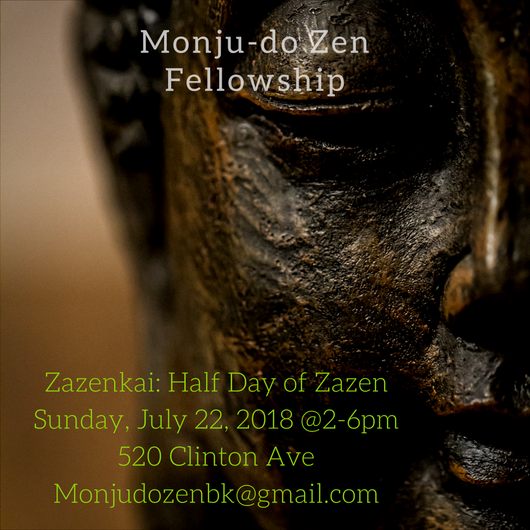 Also, September 16 we will have another half-day zazenkai. More info soon. 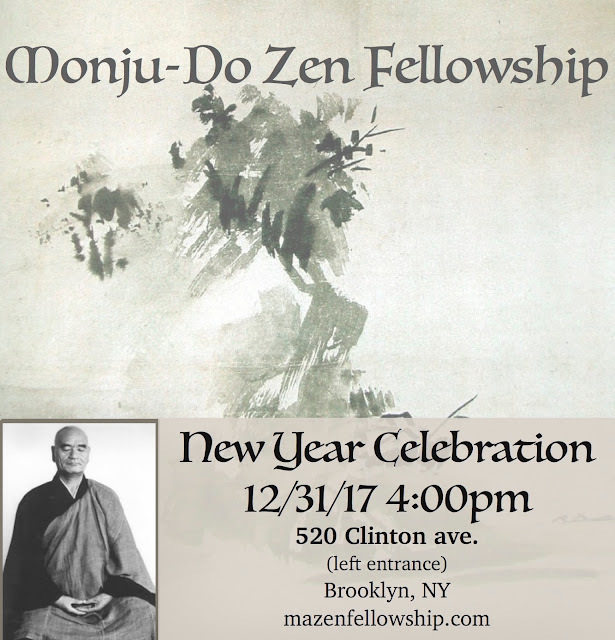 To close out the turbulent year of 2017, join us before your NYE festivities on Sunday at 4p for zazen and a New Year's celebration. 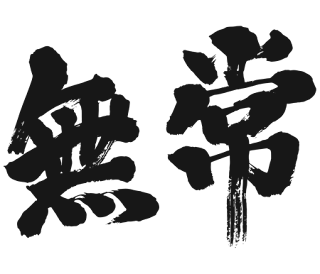 2017 is significant, as it marks the 50th anniversary of Taisen Deshimaru bringing our lineage of Zen from Japan to the West. We are also humbled to close out our first year in our new home at St. Luke and St. Matthew, and are grateful to all of you who have come to sit with us in our earliest stages. We wish you peace in the new year and look forward to many more years to come.